An etched Heliodor crystal from an older find at the Cruzeiro Mine. There were many of these specimens available, but very few of them were of a quality that met my standards. The photograph does not do this specimen justice. It is much better looking in person. This crystal has a medium yellow color and an Aquamarine-colored, modified termination. This crystal shows unusual etching patterns around its surface which makes for a texture that feels just a little bit rough to the touch, although it certainly appears smoother from a distance. The visual effect is to make the surface more sparkly from the extra minute reflection points. Classic Brazilian Beryl from a modern-day classic location. Aquamarine is almost unheard of and far down on the list when you think of minerals from Arizona. This specimen along with a handful of others were collected from a single pocket between 2004-2009. This excellent diverging cluster of lustrous, translucent, parallel-growth crystals has frosted prism faces of a cornflower-blue hue and has a deep-blue color when viewed down its c-axis. 4.8 x 3.4 x 4.6 cm. An exceptionally nice (especially for Germany) translucent, pale green-blue aquamarine crystal, perched on a matrix of Quartz. 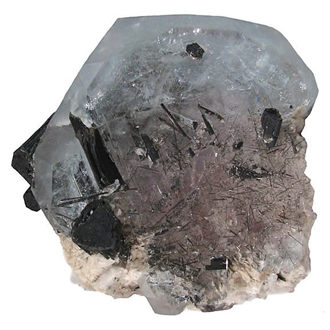 Beryl specimens from Germany are few and far between and are usually not terminated. When they are it is usually a flat termination that is often crude. Not only is this Aquamarine terminated, the termination is a Pyramidal one. Another interesting feature of this Aqua is that it is slightly curved along its c-axis. This is most likely an older German specimen from the 1800's. This piece is a classic Val Vigezzo Emerald featuring a prismatic, light green, hexagonal crystal measuring 1.5 cm on matrix. The locality of Pizzo Marcio in Italy is one of the more unique localities in the European Alps. It's an interesting pegmatite locality that is most well known for its Emerald specimens, but it also produces zeolites, metallic oxides and even rare-earth species. 2.2 x 1 x .8 cm. A double-terminated and well-colored mostly transparent crystal of Emerald with a crown of Calcite to give this specimen a little extra panache. This locality is situated in the classic area for Colombian Emeralds but good transparent, well-colored specimens are not as abundant here. An example of alkali-rich Aquamarine from a region in Afghanistan that is better known for its endless Lapis deposits and fine-quality Hackmanite specimens. This specimen features 4 translucent, color-zoned, tabular Aquamarine crystals. Blue Beryl crystals from this locality were originally described as Vorobyevite, however analysis has shown no noticeable cesium level (but with higher levels of sodium and calcium) so it is essentially an alkali-rich beryl. 7.2 x 1.5 x 1.4 cm. A gemmy and stout, single crystal of bi-colored Beryl with great color and better clarity than can be seen in these photographs. This crystal has a rich yellow color and a faint, Aquamarine-colored termination. This crystal shows unusual etching patterns around its surface which makes for a texture that feels just a little bit rough to the touch, although it certainly appears smoother from a distance. The visual effect is to make the surface more sparkly from the extra minute reflection points. An excellent Brazilian Beryl from a modern-day classic location. 5.2 x 1.4 x 1.5 cm. A gemmy and stout, single crystal of Aquamarine with a greenish-blue color and better clarity than can be seen in these photographs. This crystal has a color that is pleasing to the eye. This crystal shows unusual etching patterns around its surface which makes for a texture that feels just a little bit rough to the touch, although it certainly appears smoother from a distance. A fine Brazilian Beryl from a modern-day classic location. 8.5 x 8.7 x 4.8 cm. I'm not sure where to start describing this specimen as it has a lot going for it. First off, I'll start by saying this; Morganite-Aquamarine combination crystals are pretty rare and when you can find them they are almost always Morganite with an Aquamarine center or one side is pink and the other is blue. You almost never see a bi-colored tabular Beryl with a Morganite core with the outer part of the crystal being Aquamarine. 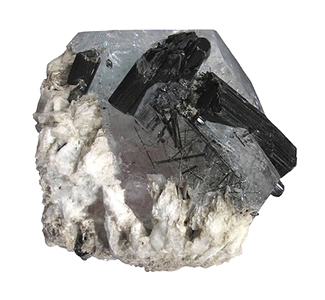 The combination of the pink and blue of the Beryl crystal along with the dark-green\black Tourmaline crystals (some of which penetrate the Beryl crystal with several of them being olive-green and quite transparent) and a whitish jacket of Albite make for a stunning contrast of colors. This specimen has no damage and is complete. The largest of the Tourmaline crystals shows signs of having broken while in situ, but has been re-healed, as is indicated by the growth hillocks that are visible on the end of the crystal. This aesthetic specimen has been used in my competitive exhibits and has been part of numerous 1st place displays. 6 x 1.8 x 1.6 cm. What can I say about Erongo Aquamarines that hasn't been said before? So I'll mostly let the pictures do the talking. This crystal possesses a good deep, inky-blue color grading from opaque to translucent to transparent at its nearly colorless termination. 4.2 x 4 x 2.5 cm. 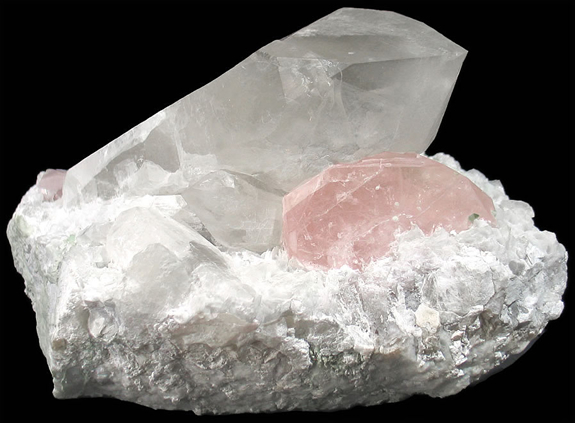 Here we have a good representative specimen of Morganite that can be found at the Elizabeth R. Mine on Chief Mountain, Pala, Northern San Diego County, California. 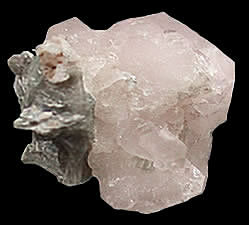 This pale-pink Morganite is nearly a floater, save for a portion of the bottom where it was attached to its matrix. 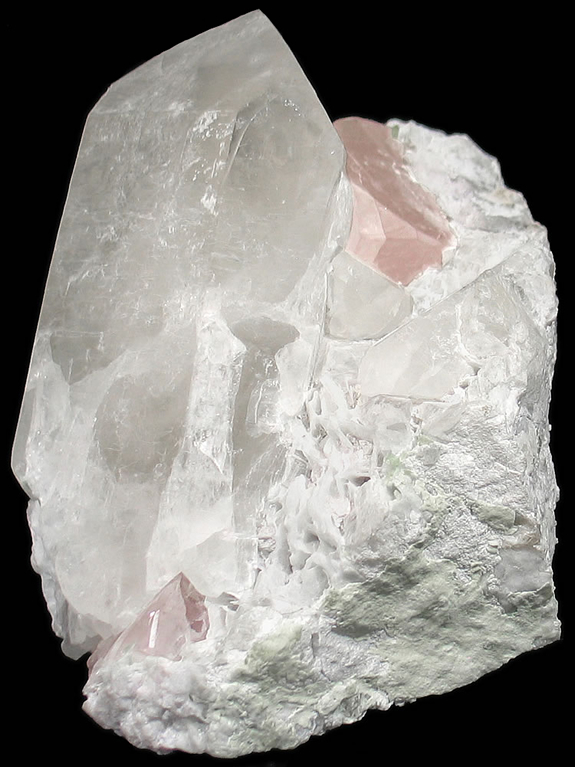 Accenting this Morganite specimen is a cluster of Muscovite. 18 x 12 x 14 cm. Largest Morganite crystal measures 7.5 x 3.5 x 2.7 cm. Here we have a whopper of a mineral specimen. 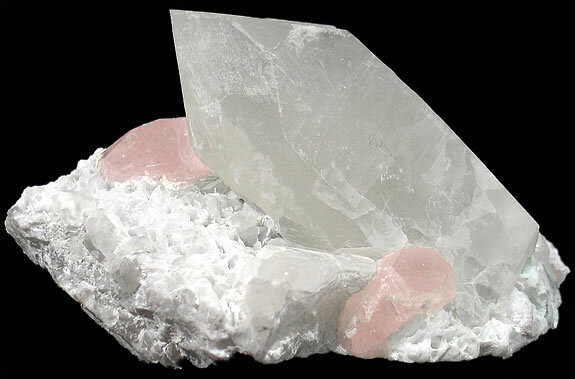 This piece has 3 Morganite crystals flanking a huge, translucent 17 cm. Quartz crystal. The largest Morganite measures 7.5 x 3.5 x 2.7 cm. and has a small green Tourmaline that jauntily protrudes from its front face. 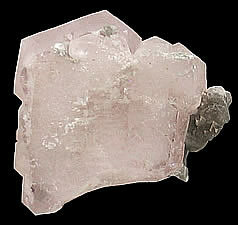 The largest of the Morganite crystals grades from transparent to translucent. The second largest of the Morganites is almost fully transparent. The “face” of the matrix is covered with a honeycomb-like mass of crystals of Cleavelandite, due to a coating of clay minerals on them. 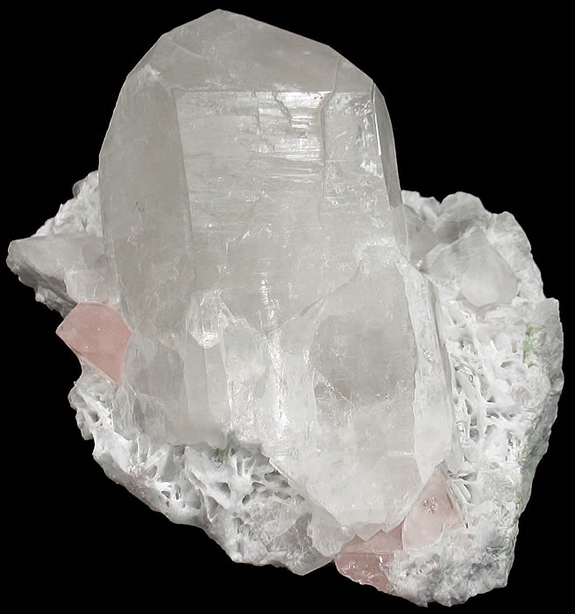 While there are a couple small clefts near the top of the Quartz crystal, they do not detract from the overall appearance of this magnificent specimen. The specimen displays well from several different angles and with minimal cleaning would look even better than it does now. I've been buying and selling Afghani minerals for almost 20 years and rarely have I encountered a Morganite specimen on matrix that has as much visual impact as this one does. Another neat feature of this specimen is that the Morganite crystals fluoresce a good whitish color when illuminated by SWUV light.